I have to say up front, I am not a fan of cats. Yet today I found myself having lunch with some colleagues at the Meow Cafe – a cafe with a definite cat inspired influence. Funnily this seemed an appropriate place for us to meet because it was a bit like herding cats just trying to get the three of us together. 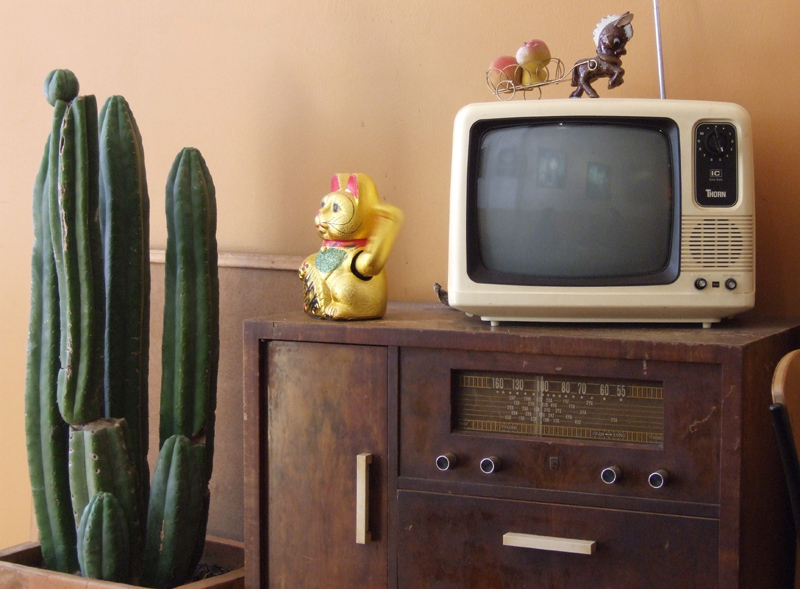 As I looked around at the quirky decor I saw items that were all too familiar to me – the old fashioned radio and television, the formica tables, the vinyl covered chairs, the patterned dinnerware. I wondered if the young waiting staff had any idea what all these items they were surrounded by were. I bet none of them could imagine the excitement of listening to a favourite programme on the radio. How many of them could imagine what it must have been like to see a television for the first time or watch their first ever television programme? I know I’m showing my age but I remember these things so vividly. As I entered the Meow Cafe today I felt like I had walked into a time machine dating back to my youth. There was however one thing that didn’t fit for me, the gold battery operated waving cats. These cats seemed so out of place but very happy to be there. You simply had to smile as they repeatedly waved at you. After doing a bit of research I have discovered that in Japanese and Chinese culture these cats are considered lucky and they are meant to bring good fortune, happiness and prosperity. It would appear that the gold coloured cats bring riches and if it is raising its left hand it is inviting customers to the business. I walked away from my lunch today feeling very satisfied from the delicious food and happy to have caught up with some good people. Thankfully the gold cats at Meow Cafe didn’t affect my allergies. Now that is the kind of cat I can live with. 03 Sep This entry was written by Marica, posted on September 3, 2009 at 11:16 pm, filed under eating out, memories, Wellington and tagged allergies, cafes, cats, decor, luck, old, technology, time. Bookmark the permalink. Follow any comments here with the RSS feed for this post. Post a comment or leave a trackback: Trackback URL.